On the Comper Organ Gallery, the panels of the balustrade have recently been hung with a facsimile type of Think and Thank Screen Panel to bring into the church some of the names of those that died and who were not included here in St Andrew's at the time. 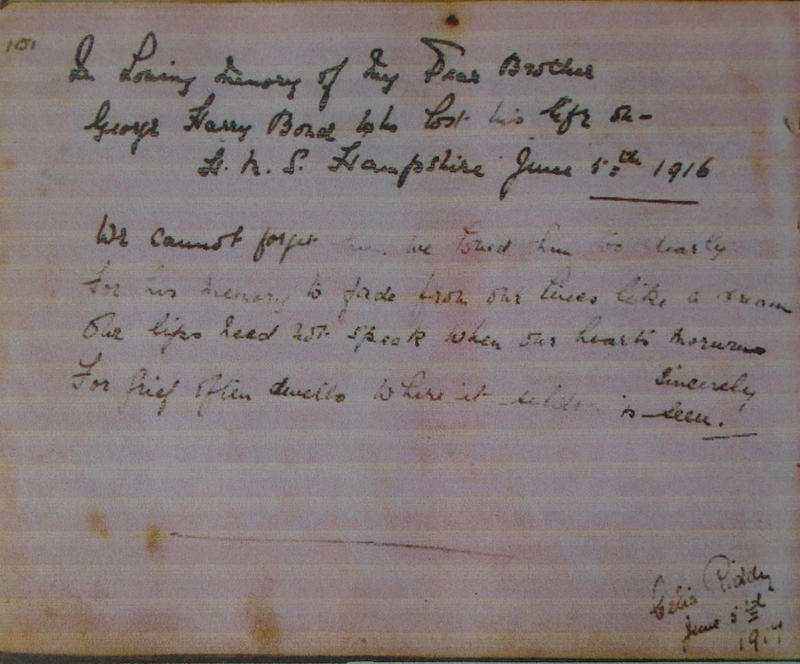 The Log Book makes no mention at any time during WW1 of casualties and in this case it is possible that it was not known at the time that Ship’s Corporal George Harry Bond was on board. His name is inscribed on the village obelisk in Station Road under 1916. There are no other details and what follows has been gleaned from a wide variety of sources. “The report of Mr C.I. Watts as to engine repairs for the Ryburgh Mill was read and it was decided to put down a first class engine and Galloway Boiler capable of driving a four sack roller plant independent of water power and that Messrs. Riches and Watt, Turner & Son, Holmes and Sons Ltd., and Ransommes, Simms and Jefferies be invited to supply specifications and estimates for the same”. There was a full report in the pages of the “The Miller” for the 6th November 1893 of the inauguration and celebration of the completion of the new roller milling apparatus at Ryburgh’s 5 floor Mill (now demolished) on October 20th 1893. The motive power when water is plentiful is principally derived from a Duncan's turbine water wheel, which was put down by Messrs Whitmore & Binyon in 1858, and to assist this wheel when the water is scarce, a horizontal compound condensing engine, built by Messrs Holmes & Sons Ltd., Norwich, with cylinders 10 inches by 17 inches and 22 inches stroke, running at a speed of 98 revolutions per minute, and controlled by a Turner-Hartnell governor, acting on the cut-off valve of high pressure cylinder, is employed. The main shaft of the roller plant is at right angles to the countershaft of the engine, to which it is connected by bevel gearing, and an arrangement is provided for disconnecting the engine when it is not required to drive the mill. The necessary steam to drive the engine is obtained from a double-flued Galloway boiler, 16 feet long and 6 feet 6 inches in diameter, also put down by the same firm who built the engine. 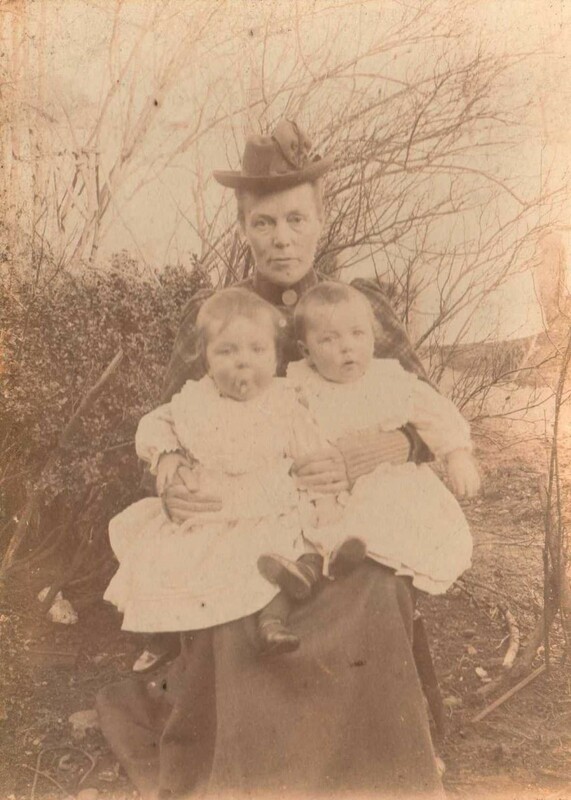 Clara and the twins photographed circa 1901. 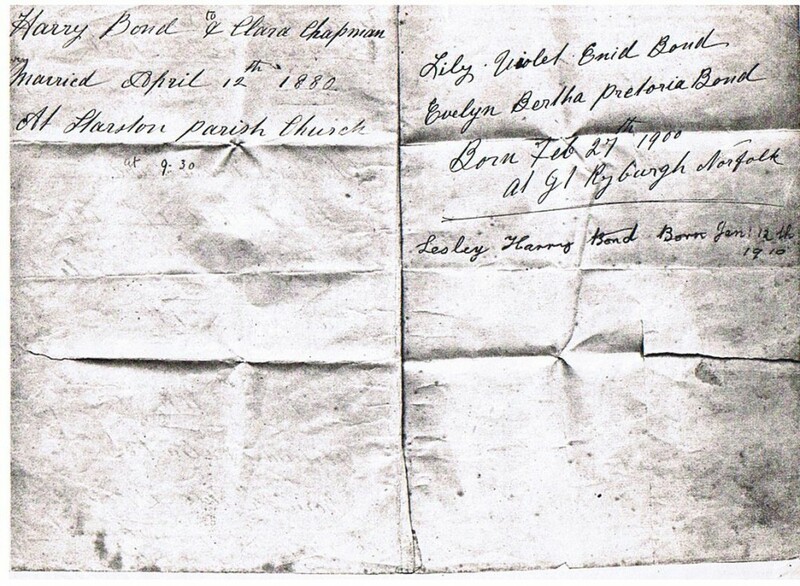 Harry and Clara were married on April 12th 1880 at Starston and George Harry Bond was their eldest child born on June 28th 1881. 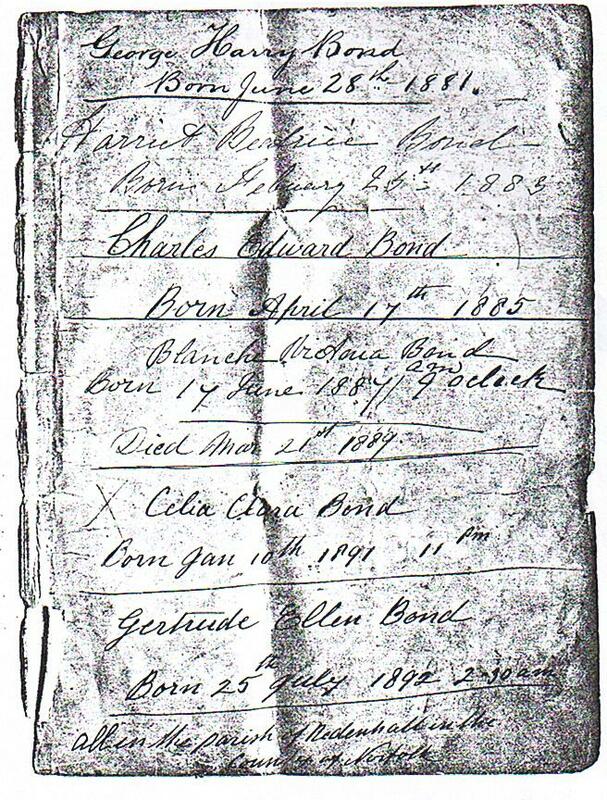 Harriet Beatrice was born 25th February 1883, Charles Edward 17th April 1885, Celia Clara 10th January 1891, Gertrude Ellen 25th July 1892. As Gertrude, was the last of their children born at Redenhall, they would seem to have have moved to Ryburgh soon after as the following entries are found in the School Log Book for November 1895. and refers more likely to Charles Edward than George Harry who would have been 14 and of age by then. Mr Bond, after interviewing the Managers was allowed to send his boy back to school, conditionally. Dismissed the boy Bond for insolence & disobedience by order of the Managers. A. Foster. 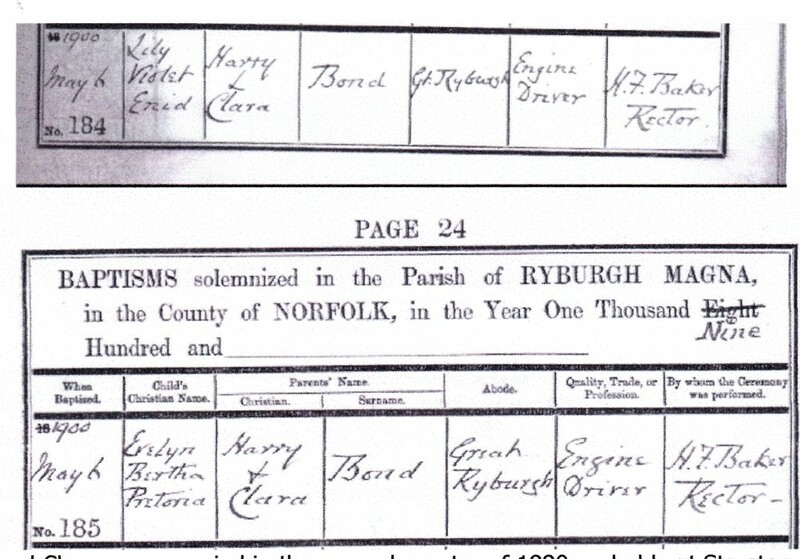 The 1901 Ryburgh Census names 4 stationary engine drivers, two without identifying their work place, John Coates and Phillip Platten and two that do, with John Curson at the Maltings and Harry Bond at the flour mill. The foundry also had an engine to power the machine shop. It is not unreasonable to suppose that the new engine at the mill required a new man for the job………….whatever the case, by 1901 Harry Bond was in charge of the new “horizontal compound condensing engine, built by Messrs Holmes & Sons” at the Mill. In the 1901 Census all the family except George Harry are living in Mill Road. It is difficult to interpret the order in which homes are scheduled but they are described as being Nr. 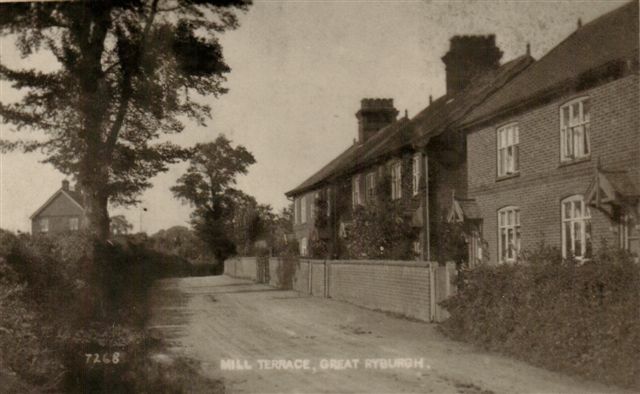 Mill and with reference to known properties and inhabitants my surmise is that they lived in one of this collection between the Mill and the church as seen in the 1906 OS Map detail and the postcard view which is probably the place where the family group was taken circa 1906. 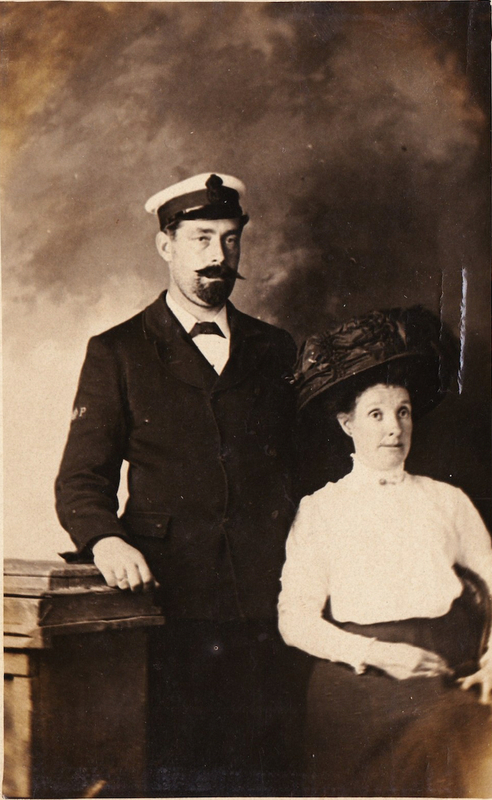 George Bond's hat band reads "HMS Erebus" and his service record shows he was with this vessel between April 19th and October15th 1904 which fairly precisely dates this photo. George Harry Bond’s service record shows that he signed up as Ordinary Seaman 190843 (Po) on H.M.S. Ramillies for 12 years on June 28th 1899 after completing his training which he had begun on September 28th 1896. He was described then as 5’4” and fresh complexion. On joining up he was then 5’8” , dark complexion and tattooed thus: Cross hands with “True Love” on his Right Forearm. The portrait below was described as George aged 16 making the date 1897 in the middle of his period of training. Displacement: 14,150 tons. Horse power: 13,000. Beam: 75ft. Draught: 27' 6". Armament: four 67 ton guns in armoured barbettes. Armour: partial armour of 18 inches thick. Speed: 17.5 knots. A Royal Sovereign Class Battleship of the Royal Navy. Built by J and G Thomson at Clydebank and launched 1st March 1892. Ramillies cost just over £900,000 to complete. She served her last years in home waters before being scrapped on 7th October 1913. 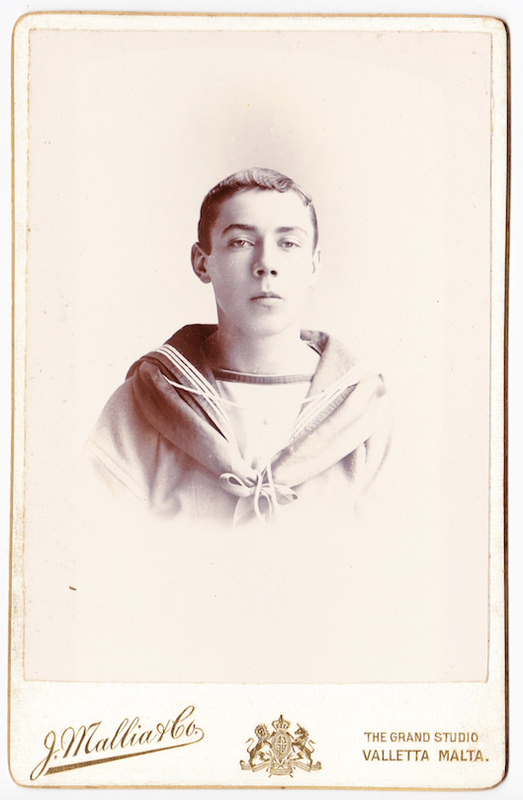 The 1901 Census finds George Harry, now 19 years old and an Able-Seaman at sea in Valletta, Malta on board H.M.S. 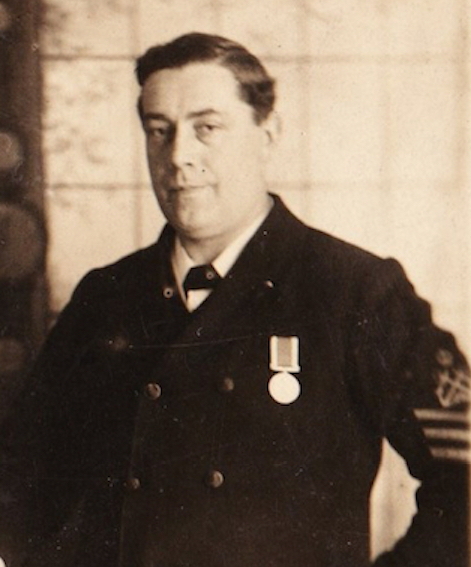 Ramillies, He served on a further 14 other vessels before joining H.M.S. Hampshire on January 27th 1914. 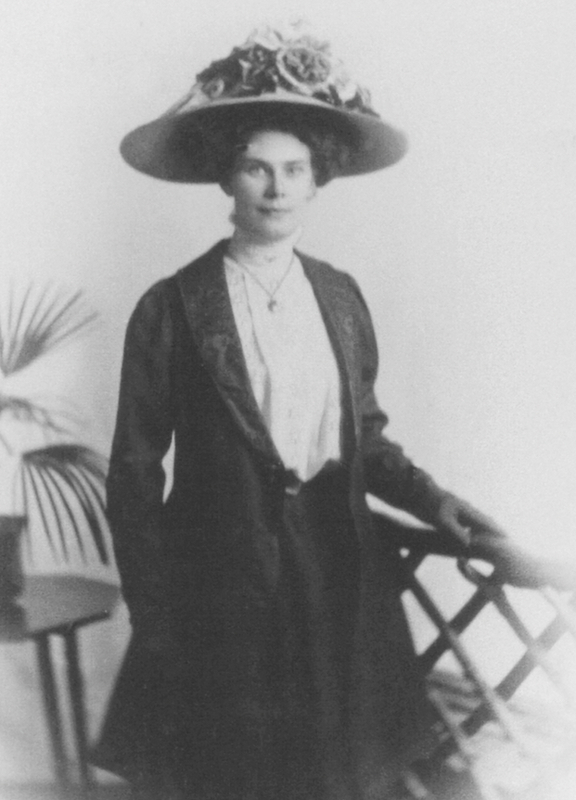 It was in 1906 (the 3rd quarter of that year) that George married widow Florence Emily Greengrass (nee Sherwin, born Battersea 1876) in Portsmouth. The 1911 Census suggests that she had two children with her first husband but that both had died but this is far more complex than just this brief evidence outlines and the family history tells a tragic story of which a full account will be on this page shortly. This photgraph was printed in a postcard format and mailed to Harry and Clara Bond in Ryburgh in September 1911. 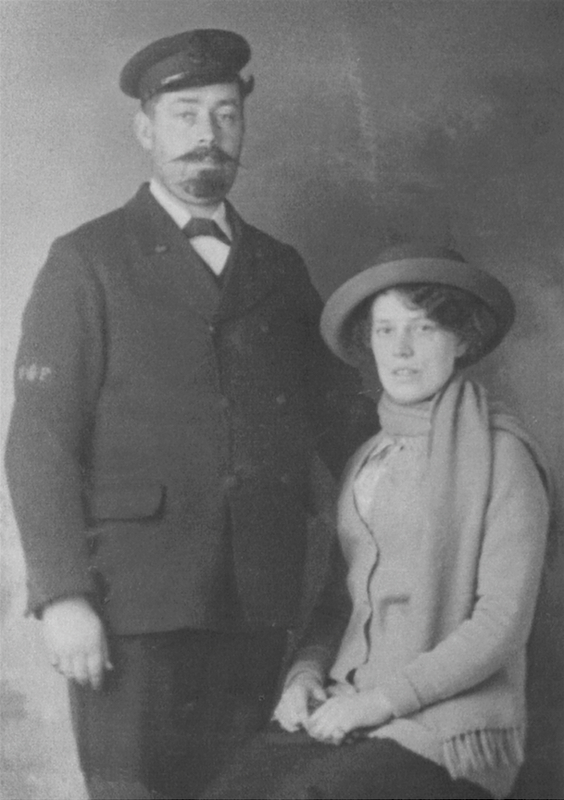 A very similar photo, that at one time was thought to be of George and Florence and the request for Gerte's address on the card above leads one to speculate that he was photographed with his sister Gertrude Ellen on the same occasion? We have been sent a link to a newspaper article about the family's remembrance of him in Portsmouth. This is not the end of the story for the Bond family and certainly just the start of the wider picture! Four of George Harry’s sisters all married men who fought in the War. 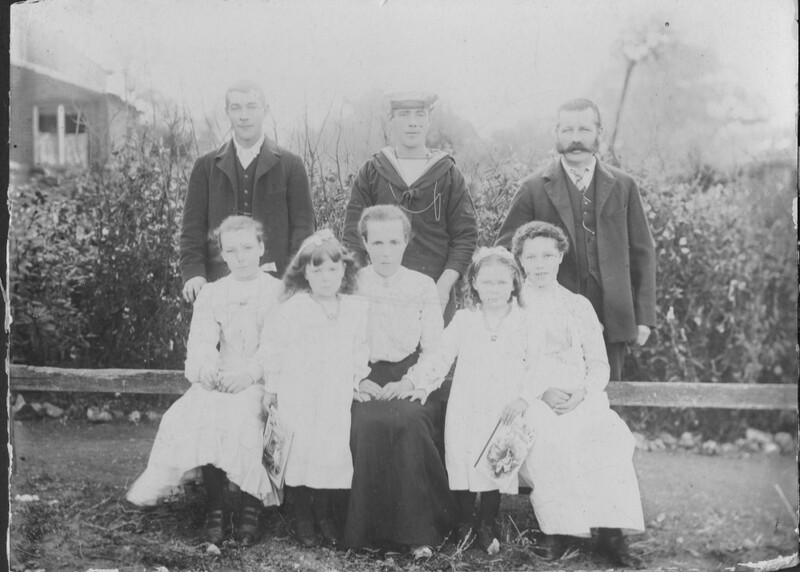 Apart from Harriet Beatrice Reeve who remained locally, they all had children baptized in Great Ryburgh, having come home to Ryburgh for the births of their first two children respectively during and after the War. Celia had a son Leslie Harry Bond, born 12/01/1910 and conceived when Celia worked in service at Hawkwood Estate near Chislehurst, Kent - but as Celia was not allowed to keep the child there, he was fostered by Sarah Jane and James Hutcherson (a flour packer at the Mill) after birth - until Celia found new employment with Lord Desborough at Taplow Court, near Windsor, Berks in 1912 - where she was able to keep the baby. She met Arthur Riddy (born in Derby in 1884) when he was with 5th Dragoon Guards stationed at Windsor Castle. 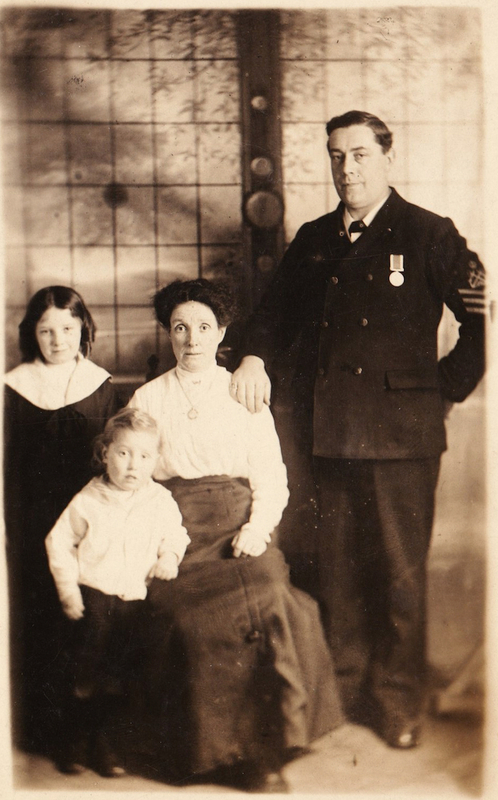 He had enlisted in January 1901 and entered the War in October 1914. 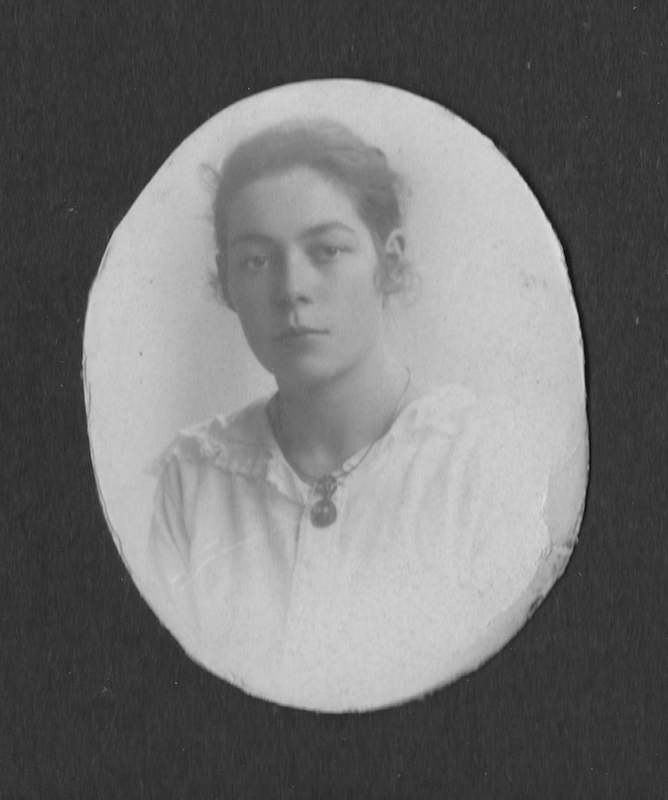 Celia met Arthur at an army dance at Taplow Court and they were engaged on 17 Jan 1914. 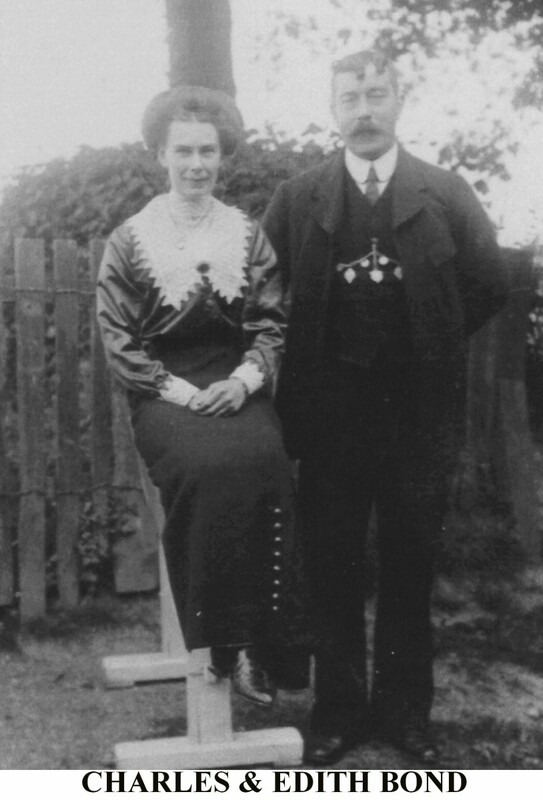 They married at Windsor Registry office in July 1915 after Arthur was invalided out of WW1. Arthur Ivo was born at Celia's mother's home in Gt Ryburgh in 1916, and shortly after, the family with Harry and Ivo left Taplow Court for Maidstone, Kent, when Arthur was honourably discharged on 8th. 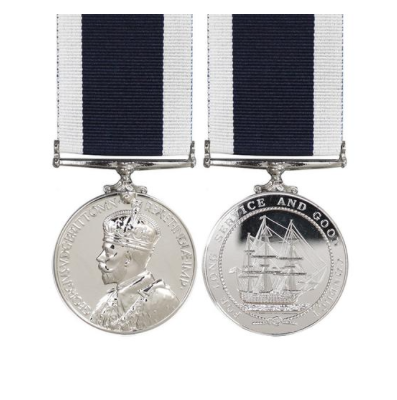 April 1916 under King’s regulations: cause “sickness” and awarded in addition to his 3 War Medals the Silver War Badge No 174435. In 1918 they moved to Lindfield, West Sussex. Clara Celia Riddy penned the following verse on the first anniversary of George's death in a scrapbook made during her time at Taplow Court and is reproduced by kind permission of the Riddy Family. 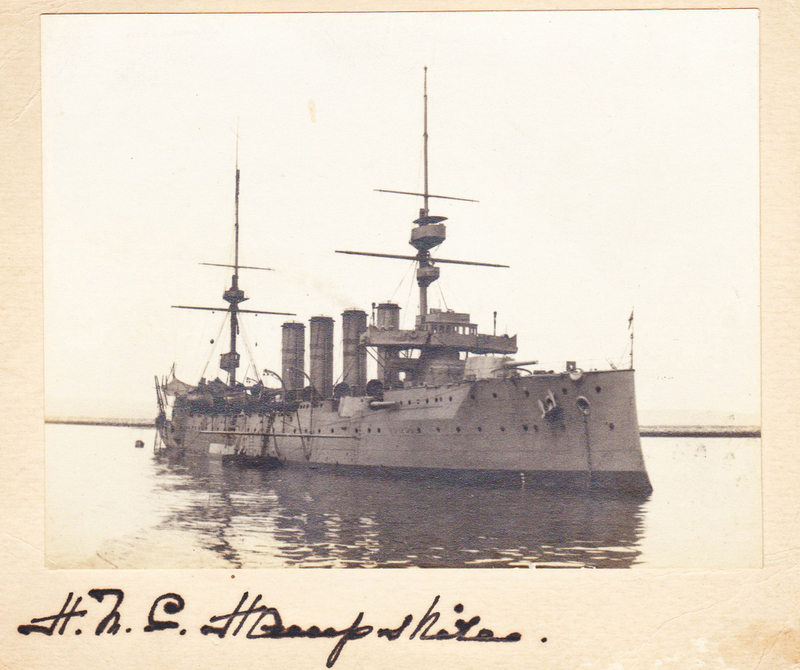 In loving memory of Dear Brother George Harry Bond who lost his life on H.M.S.Hampshire June 5th 1916. 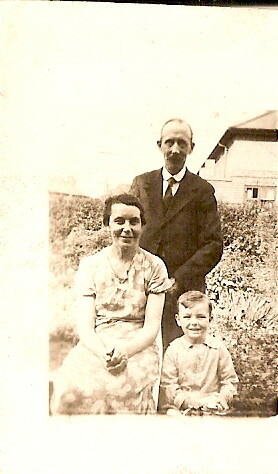 Gertrude Ellen, born July 1892, married Francis Watson Gazeley a Canadian born plumber on April 5th 1915 at St Andrew’s Church. It was deemed that he was physically unsuitable as an engine driver and he went on to gain an army electrician’s qualification. He seems to have spent the war on the home front in this technical capacity. 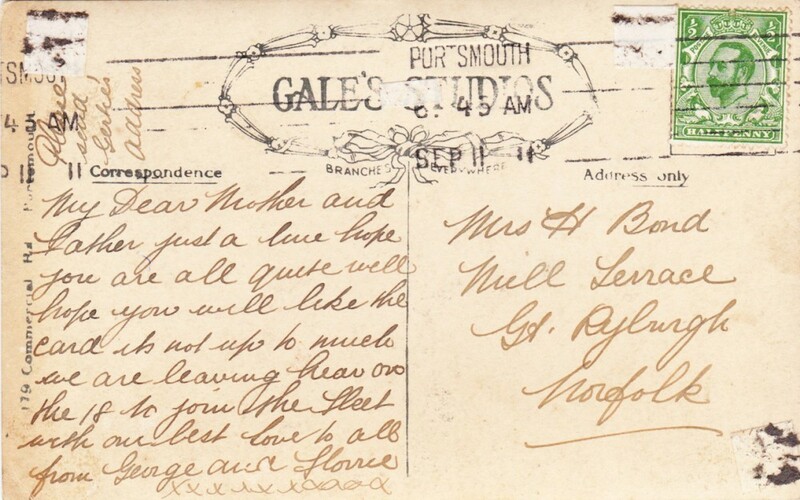 He was discharged in February 1919 to an address in Essex. George Arthur Wallinger, born 1894 in Rotherham, enlisted at Aldershot in July 1915 and joined the Army Service Corps. His record describes him as “a good packer and loader” He was drafted to Etaples in August 1915 but back in England the following month having been hospitalised with a pre-existing inguinal hernia. 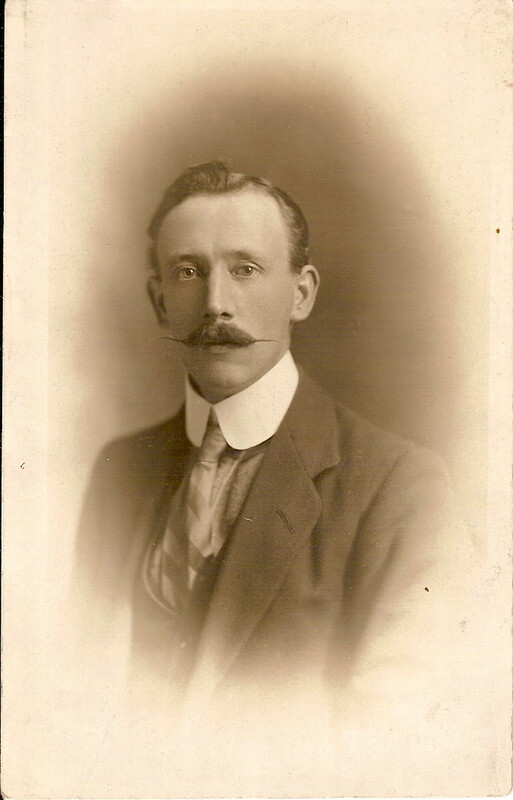 He was honourably discharged as “no longer physically fit for War Service” on May 10th 1916. 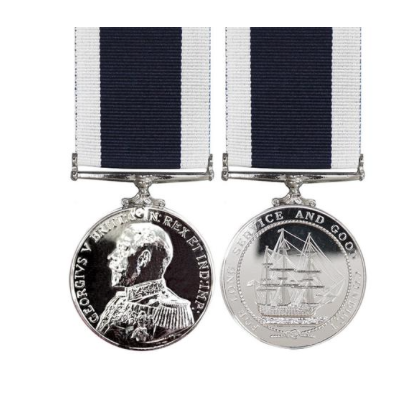 With Silver War Badge 64662 in addition to his 3 War Medals. Both births were registered locally indicating that Enid came home to give birth. 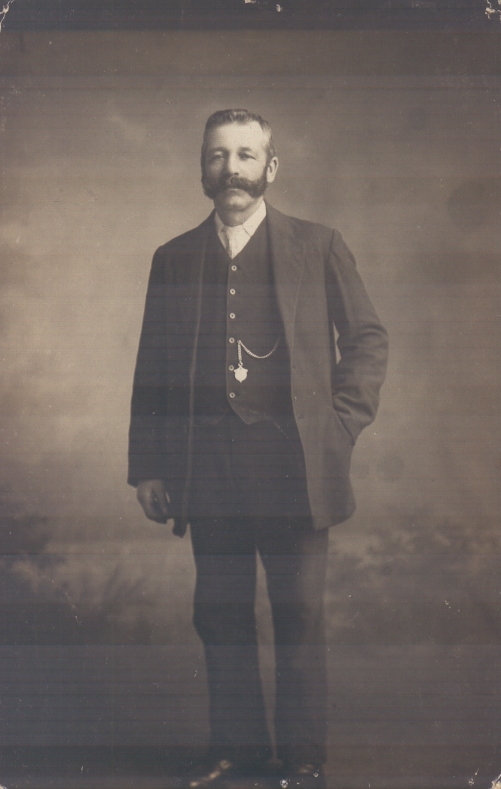 To date there is no indication as to the War Service of their brother Charles Edward Bond born in 1885., nor have any details of his life come to light except this photo and his appearance in the 1911 Census when he was lodging in Stevenage and is described as a traction engine driver. In the 1901 Census, Robert who was born in Blofield and whose father Henry was a police sergeant, was working as a groom and General Labourer in Alderford Norfolk. The circumstances of how they met are unknown but following their marriage they are found in the 1911 Census living on Gateley Common with 6 children. There were 5 more children to follow. Robert Reeve had a short-lived Army career. Having been called up in December 1915, he was attested in June 1916 and served with the 37th Btn. Royal Fusiliers in France for 4 months between July and November 1916. He was honourably discharged from Tooting Military Hospital at the end of January 1917 being “permanently unfit for service” and awarded Silver War Badge No 48698 in addition to his British War and Victory Medals. 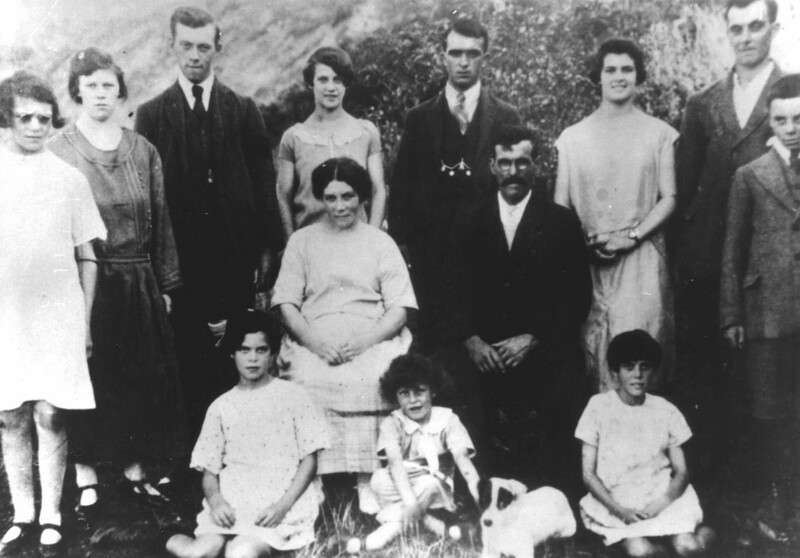 The complete Reeve family anti-clockwise: starting with"Spot" the dog, Roberta, Percy, Robert, Ena, Victor, Lilian, William, Celia, Florence, Miriam and Enid. Seated: Harriet Bond and Robert Reeve. When Robert Reeve died, he left behind 11 children, 64 grandchildren, and 125 great grandchildren. Harry Bond died 16/01/1926 and is buried in plot 50 in the area at the lower level and to the left of the entrance gates in the Lt Ryburgh Cemetery. There does not appear to be a headstone. 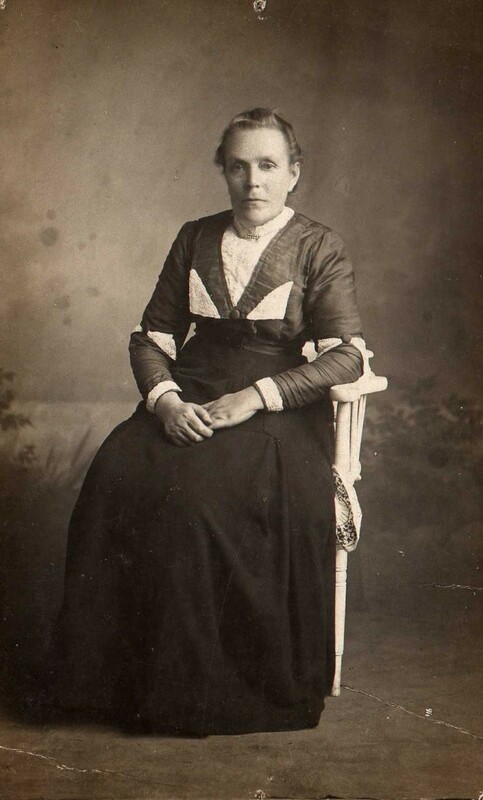 Clara Bond died in Hertfordshire on 10/7/1929 apparently after suffering a fractured femur. 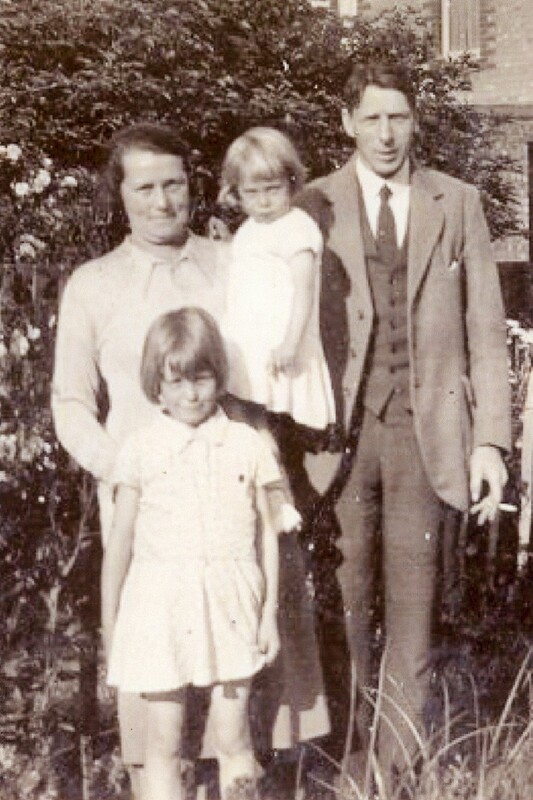 The remaining twin Evelyn, pictured below, married William Green in Fakenham in 1956 and died in 1979. If any reader has anything further to add to this brief history please get in contact via this website. We are extremely grateful to various members of the extended Bond family for many of the photos on this page.